The true, authentic Mexican food of the Midwest can be found in Indiana. 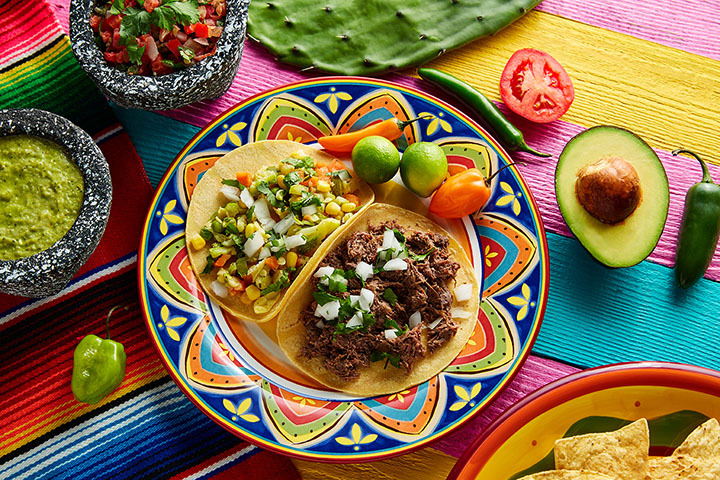 The Hoosier State is home to traditional Mexican restaurants serving up everything from delicious arroz con pollo that tastes like something straight out of a Grandmother’s kitchen, to traditional Mexican custard desserts. Here are the 10 best Mexican restaurants in Indiana! Located on Clinton Drive, Mi Familia Mexican Restaurant has been serving up delicious and authentic Mexican food in the Kokomo area since 2007. They are a family-oriented restaurant, and believe in providing an experience that makes you feel as if Mi Familia is your home, and your family is their family. Made with finest and freshest of ingredients, Mi Familia is the place to be in Kokomo. The selections are endless of classic Mexican cuisine. Be sure to try the pollo caliente or the Mi Familia Special, and to go with it, one of Mi Familia’s excellent beverages. A mango margarita or horchata is highly recommended! Another great Mexican restaurant in the Kokomo area that should be on your list is 3 Amigos. The food is amazing and they have some of the best margaritas in town. Dine out in their beautiful patio area on a warm summer’s eve, or eat inside on and experience true ambiance. One could make a meal out of their chips and salsa alone. The chips are crisp and salty, the salsa light, spicy, and flavorful! Try a giant veggie burrito or burritos deluxe, and be sure to ask for a carry out box at the end! With 10 locations throughout Indiana, El Nopal Mexican Cuisine is the place to go for food, family, and fun! The appetizers themselves are enough for one meal but no matter what delicious dish you choose, you’ll be left feeling full and happy. Are you a fan of crabmeat? Try the “krabmeat” enchiladas! El Nopal also has a great selection of ala carte items, and their desserts are scrumptious! Fried ice cream anyone? Riviera Maya Mexican Grill in Anderson, Indiana, is the place where family, friends, food and some of the best margaritas come together! The food is made to order with the freshest of ingredients, and the restaurant itself makes you feel as though you’ve stepped across the United States into Mexico. From the tile floors on the inside to the unique, eclectic stone exterior, to the amazing customer service and more, it’s easy to see why Riviera Maya is a favorite among Anderson locals and to those visiting! Head on over to El Maguey Mexican Restaurant, where the margaritas are homemade, hand-shaken with only the finest of tequilas and served on the rocks. You can also indulge in a Bahama Mama cocktail or a delicious Long Island Tea. Besides their drinks, El Maguey also has some of the finest and most delicious Mexican food one could hope to find in Indiana. The Santa Fe salad is to die for, and their Nachos are out of this world! Feel to create your own combo as well, such as the traditional Arroz con pollo or the chile colorado. No matter your choice, everything is fresh and delectable. El Carreton Mexican Restaurant in Winchester, Indiana, is a favorite among the locals and visitors alike. Open since 2006, El Carreton has been serving up traditional Mexican flavor and providing a family friendly establishment for over 10 years. Louis and Ricardo are absolute gems, and the rest of their staff provide outstanding customer service. The nachos reales are a favorite and come highly recommended, as is the burrito el gobernador. Tlaolli (pronounced Tlah-oh-lee) serves up some of the best Tamales in the Indianapolis area. Everything on the menu is carry out, and each item is made with the freshest of ingredients and are made with 100 percent olive oil, making them more heart healthy than other Mexican or Latin American dishes. Tlaolli is a favorite among vegans and vegetarians alike. If you are looking for something unique and fun, Tlalloi is who you want to see. They also offer catering in Indianapolis and other surrounding areas (be sure to call first). If you ever find yourself in the Noblesville area and craving authentic Mexican food, be sure to visit El Palenque. Open seven days a week, El Palenque offers some of the best Mexican food in the heart of Noblesville. Everything is made with the freshest of ingredients. Try the Taquitos Mexicanos and for dessert, the delicious traditional Mexican custard, also known as flan, or the tres (3) leches cake. Your taste buds will thank you! If the Tamale Place name sounds familiar to you, that’s probably because the restaurant was another Indy favorite featured on the popular Food Network show, “Diner’s Drive-Ins, and Dives.” Each of the tamales here are handmade and hand tied. The masa is made with freshly ground corn every day, giving them that delicious homemade flavor. The Tamale Place has been family owned and operated since 2003, and as of 2014, they have three restaurants throughout the Indianapolis area. It’s easy to see why the restaurant made it on the show. The food is incredible. The customer service is fantastic, and it’s a great place to enjoy authentic Mexican food. Memo’s Taco Mex is known for having some of the best authentic Mexican food in the Highland, Indiana area. The beef is 90 percent lean, as is the steak and carne asada, and everything is made fresh with the finest of ingredients. The carnitas are a popular favorite among locals, as are the mahi mahi tacos. Memo’s Taco Mex is classic and traditional!